You can add other people to any Google payments profile you manage. 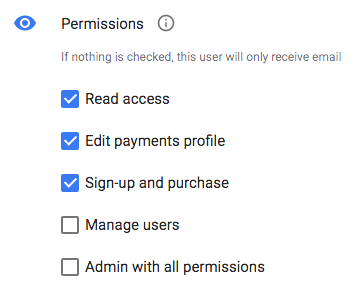 For each person you add, you decide whether or not they can invite other users, buy or sign up for paid Google services, view your payment history, or make changes to the profile. Note: People you add can see your payment information. If you no longer want someone on a payments profile, you can remove them from it. Sign in to Payments users. Choose Add a new user. 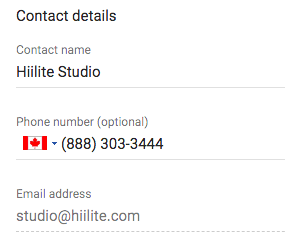 Enter Hiilite’s contact information as follow. Decide which permissions you want your contact to have. The minimum permission level Hiilite needs is “Sign-up and purchase” access. Tap or click Invite. Your contact will show as “Pending” until they accept your invitation. The invitation expires after two weeks. To resend an invitation, choose the person you want to re-invite and tap or click Resend invitation.